We stepped inside this converted house to find out what the hype’s about. 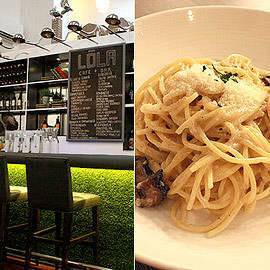 (SPOT.ph) Expectation is the driving force behind restaurants like LoLa Cafe + Bar. 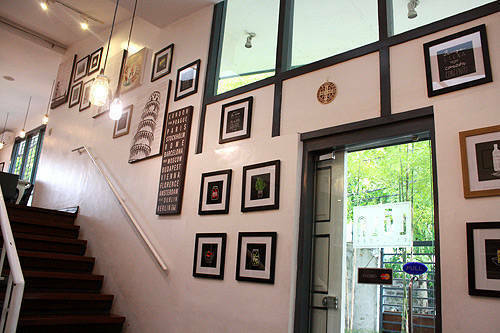 Just blocks away from the beating heart of Quezon City gastronomy, the hype behind LoLa is a build-up partly caused by word-of-mouth and social networks: the converted house down the street supposedly serves a mean Eggs Benedict and amazing pasta. Mouthwatering photos on Instagram and Twitter create a promise to potential diners that they’ll find something good here. Dee and his partners kept the original layout of the house. But this homey abode delivers more than what’s expected-enough to make people take the extra mile past the restaurant-lined South Triangle and into the trappings of the predominantly residential street of Scout Lozano. "Eighty percent of our customers come here with a purpose," says Howard Dee, one of LoLa’s owners. 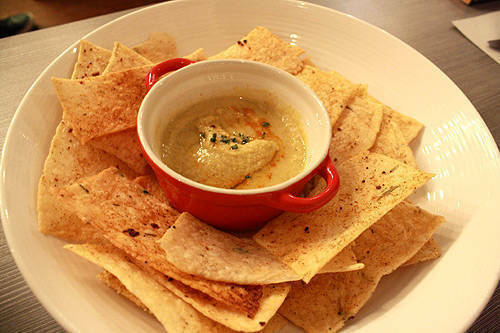 "They come looking for a packaged dining experience with great food, ambiance, and service." Find the spoon and fork cupboard handles. LoLa is camouflaged by suburbia, unruly trees, and a row of similar-looking houses; only a small sign and an excessive number of cars in the driveway indicate that something else is going on. "We stumbled upon this house and it just made sense," Dee says. The place is airy, with gabled roofs and a wraparound porch that’s wide enough to serve as an al fresco deck. Interiors that are predominantly black, white, and gray give it a cool modern feel, but charming kitschy elements like spoon- and fork-shaped door knobs, old books, mason jar accents, and a restored table from the original house give it the nostalgic vibe that the owners intended. The countryhouse effect works well with breakfast and brunch-and it’s not surprising that this is the type of cuisine that LoLa first served back when they opened in September 2012. "It gave us time to work on new dishes and introduce Filipino food," adds Dee. 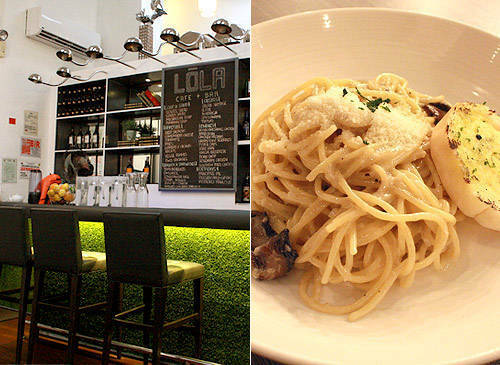 A happy combination of those two distinct styles is perhaps the most photogenic and photographed dish in LoLa’s menu. 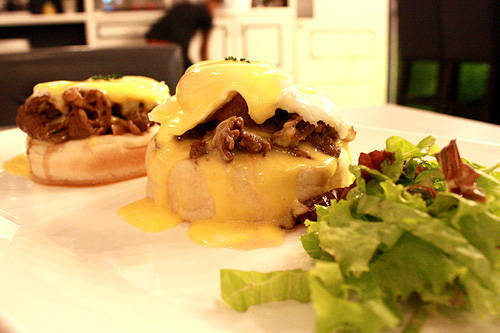 The Tapa Benedicts (P350) merges two schools of breakfast: a tapsilog but with the characteristic English muffin taking over the carb component. The twin towers of plump, poached eggs are breathtaking, with tangy slivers of cured beef cooked to a juicy medium rare; underneath, a treasure of crunchy caramelized onions and bits of tomato. The English muffin is fluffy, but firm enough to carry the heavy load and easy enough to slice. Textures collide in every smorgasbord of a bite. 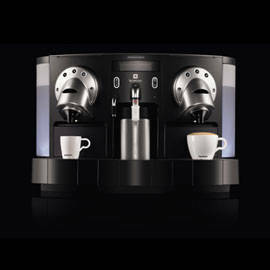 Following its success, LoLa also recently introduced a salmon version (P480). 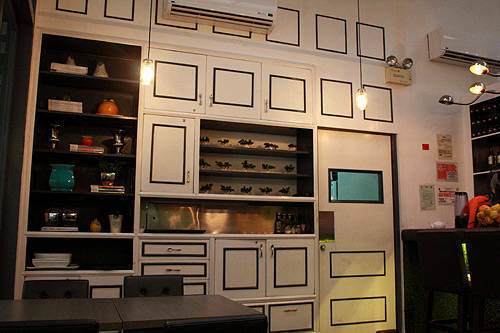 The much-talked-about pasta selection is in an unassuming corner on the menu, but it shouldn’t be overlooked. The Tartufo (P260) is surprisingly cheap for Portobello and truffle. Mild, but with just enough truffle oil to seduce the palate. 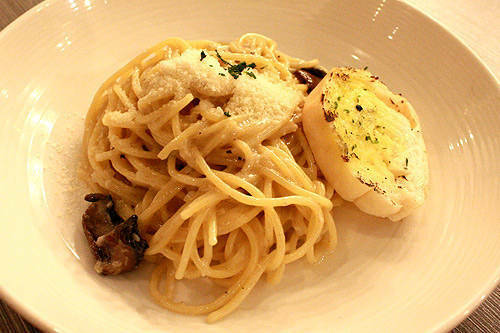 The pasta is perfectly al dente, which makes eating it truly enjoyable. But while it’s pumped with flavor, the Rosemary Chicken (P360), on the other hand, is teasing, careful to only ease the strong piny flavor of rosemary onto your tastebuds. The flavors are subtle, but how they manage to seep through even the deep recesses of the chicken is so impressive that we can only close our eyes and shake our heads in disbelief. Wash everything down with LoLa’s quirky Mocktails and Cocktails. 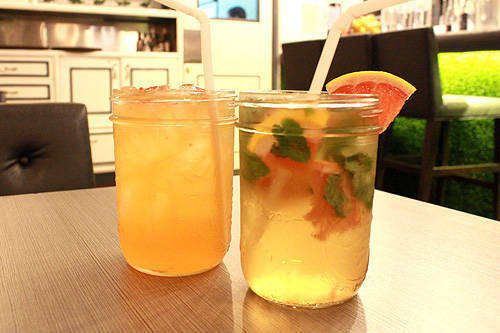 The non-alcoholic Rio (P120) is a refreshing twist of grapefruit and apple juices; shredded mint leaves give it a kick, just strong enough to block out the summer heat. On the other side of Brazil is the Sao Paulo (P195), as refreshing as the Rio is, this one plays on innovation with slices of bell pepper mixed in with lychee syrup, apple juice, whisky, and vodka. It was nighttime when our first trip to LoLa finally ended. Standing on the porch outside the little white house, full and satisfied, a soft breeze enveloping the garden-lined space in a comfortable chill. Living up to hype isn’t easy, but LoLa rises up to the challenge well. And whenever we’re asked the ever confounding question of where to hang out-either solo or with friends-the answer becomes increasingly simple: at LoLa Cafe + Bar, nursing a mason jar of the Rio.